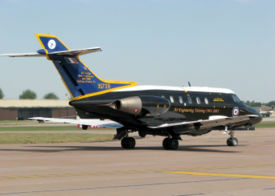 The twin-engined British Aerospace BAe 125 is the world's best selling mid-size corporate jet, with newer variants now marketed as the Hawker 800. It was known as the Hawker Siddeley HS125 until 1977. It is also used by the British Royal Air Force as a navigation trainer (as the Hawker Siddeley Dominie T Mk. 1), and was used by the United States Air Force as a calibration aircraft, as the C-29). The aircraft went through many designation changes during its service life. Originally DH.125, it was renamed the HS.125 after de Havilland became a division of Hawker Siddeley in 1963. When Hawker Siddeley Aircraft merged with BAC to form British Aerospace in 1977, the name changed to BAe 125. Then, when British Aerospace sold its Business Jets Division to Raytheon in 1993, the jet acquired the name Raytheon Hawker. The fuselage, wings and tail-fin are to this day fully assembled and partially equipped (primary and secondary flight controls) in Airbus UK's Broughton plant in Wales, sub-assemblies are produced in Airbus UK's Buckley (Bwcle in Welsh) site. All these assembled components are then shipped to Wichita, Kansas in the United States, to where final assembly was transferred in 1996. C-29A - Series 800 for US military designed to replace the Lockheed C-140A, used by the Air Force Communications Service to check navigation aids and communications at US airbases around the world, participated in Operation Desert Shield and Operation Desert Storm during the First Persian Gulf War. Donald, D.; Lake, J. (editors) (1996). Encyclopedia of world military aircraft.. AIRtime Publishing. ISBN 1-880588-24-2. Mason, F. K. (1991). Hawker aircraft since 1920. Putnam Aeronautical Books. ISBN 1-55750-351-6. It uses material from the Wikipedia article "British Aerospace 125". This page was last edited on 26 April 2008, at 01:02.